Coming home from Dodger Stadium late in the afternoon, we drove along a quiet street that crosses over the freeway leading into Los Angeles. It gives an interesting view of the LA skyline. 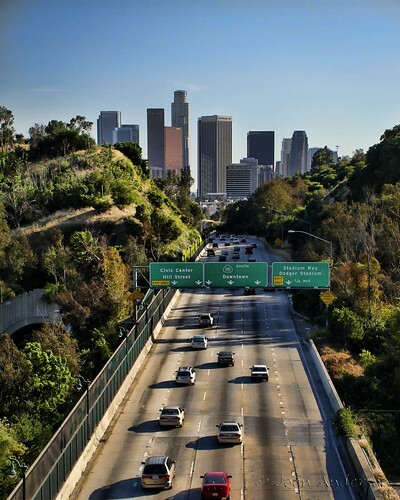 The 110 Freeway (shown below) connects San Pedro with Pasadena. This section (from the 101 to Pasadena) is the historic Arroyo Seco Parkway, the first freeway in California. Great composition. And no hard traffic, which is so good.